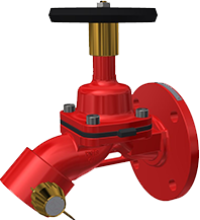 The Knowsley SK diaphragm valve series is a range of weir type diaphragm valves designed specifically for use in firefighting applications. Available in both bibnose and horizontal configurations the valves are supplied with flanged inlet connections. The valve is constructed from high quality materials with a gunmetal body and a fire resistant seal which the diaphragm closes.